An accurate count of real refugees now alive numbers around 20,000. In the words of a veteran Washington hand, the problem of the United Nations Relief and Works Agency (UNRWA), the main UN agency dealing with Palestinians, is always important but never urgent. 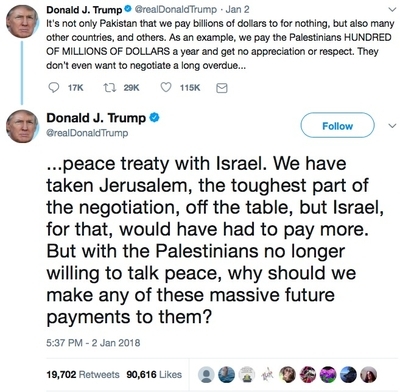 That's because President Trump tweeted "with the Palestinians no longer willing to talk peace, why should we make any of these massive future payments to them?" Then, U.S. ambassador to the United Nations Nikki Haley added that the U.S. government is prepared to cut off funds to UNRWA. And, Axios reported, a U.S. payment of $125 million was not delivered (though that was later denied). The American taxpayer is UNRWA's largest donor, paying in $370 million in 2016. Few expenses would be more satisfying to cut from the federal budget, for UNRWA has a long record of misbehavior: incitement against Israel, supporting violent attacks on Jews, corruption, and perpetuating (rather than ending) the refugee problem. Not surprisingly, many attempts have been made in Congress to cut its funding. But, as Steven J. Rosen documented with regard to ten initiatives in the years 1999-2014, every one of them ended in failure because of Israeli government opposition. Because of what, you ask? Yes, contrary to what one might expect, the Government of Israel wanted continued U.S. payments to UNRWA, fearing that their termination might cause a new intifada, the collapse of the Palestinian Authority, or renewed warfare with Hamas. Also, Jerusalem sees UNRWA as a lesser evil than alternative recipients of the money, such as the PA.
Perhaps this time, with the president wanting funds to be stopped, that will happen? Not likely, because, as a news report from Israel indicates, while Prime Minister Binyamin Netanyahu has publicly endorsed an American cut, behind the scenes he may be seeking to block or slow down this move, and for the usual reasons. Should that be so, it's hard to imagine the president and members of Congress ignoring his wishes, as they never have until now. Even were U.S. funding to UNRWA ended, plenty of governments – and even individuals – could easily replace the $370 million, and have incentive to do so. Qatar could consolidate its role as protector of the Palestinians. Beijing could purchase a role at the heart of Arab politics. Moscow could reverse some of the damage of siding with Tehran. Carlos Slim, estimated by Forbes today to be worth $67.9 billion, could decide to burnish his Arab credentials. Worse yet, were any of them to fill the funding gap, the Trump administration would look ineffectual and isolated. I suggest that withholding funds is not the right tactic. Better would be to focus on the "Palestine refugee" status. And even if no one replaced U.S. donations, denying UNRWA money does not get to the heart of the problem, which lies not in its sponsored activities but in its perpetuating and expanding population of "Palestine refugees" in three unique, even bizarre ways: allowing this status to be transferred without limit from generation to generation; maintaining the status after refugees have acquired a nationality (such as the Jordanian); and assigning the status to residents of the 'West Bank and Gaza, who live in the putative Palestinian homeland. These tricks allowed UNRWA artificially to expand the refugee population from 600,000 in 1949 to 5.3 million now; an accurate count of real refugees now alive numbers around 20,000. Therefore, while enthusiastically endorsing Trump's political goals, I suggest that withholding funds is not the right tactic. Better would be to focus on the "Palestine refugee" status. Denying this to all but those who meet the U.S. government's normal definition of a refugee (in this case, being at least 69 years old, stateless, and living outside the West Bank or Gaza), diminishes the irredentist dagger at Israel's throat by over 99 percent. It also puts the "Palestine refugee" status into play, permits millions of Palestinians to live more healthily, addresses the dank heart of Arab anti-Zionism, and helps resolve the Arab-Israeli conflict. Accordingly, I propose that the president adjust U.S. policy to work with Jerusalem and continue to send aid to Palestinians while making it contingent upon the overwhelmingly majority of recipients formally acknowledging that they are not now and have never been refugees. The Middle East Forum, which has been working this issue since 2010, has proposed legislation to make such a shift. It's both simple and feasible, as it does nothing fancier than bring Washington's relations with UNRWA into line with U.S. law and policy. About time. Posted with permission. Also appeared in the Washington Times. Mr. Pipes (DanielPipes.org, @DanielPipes) is president of the Middle East Forum. © 2018 by Daniel Pipes. All rights reserved. Addendum: A source in the State Department confirmed to me that the $125 million tranche was not delivered to UNRWA and that the department is debating what to do about these funds.